The software provider of online slot machines, the company Playtech, pleases its fans updating the game software. We present you the second part of the interesting history about the Iron Man. «Iron Man 2» slot is a new game with improved graphics and interface. 5 reels and 25 paylines allow you to collect a maximum of winning combinations. There is also the four progressive jackpots. You can enthusiastically play «Iron Man 2» slot game - everything is so colorful and nice. In this slot, there are symbols that occupy two sectors on the reel, there is a Wild symbol and a Scatter. If you gather from 3 Scatters in any position, you get 10 free spins with an increasing multiplier (from x2). The slot «Iron Man 2» has 6 symbols depicting the iron suit. They occupy two cells of the reel making paying combination. «Iron Man 2» slot belongs to Marvel machines which are associated with the four progressive jackpots. Such a system exists only in the slots of this producer. In the slots of others manufacturers, such as Novomatic, Gaminator, the jackpot is basically one. You can verify this by playing the slot machine “Book of Ra” on our site. You can play Iron Man 2 slot for free or for money - it is equally interesting. To get the adrenaline, excitement and the jackpot you must play for real money. The slot machine «Iron Man 2» strikes in everything: a superhero theme, stunning graphics, great sound, bonus games, free spins and a chance to win one of four progressive jackpots of Marvel superheroes. A couple of minor bugs will not prevent you to get pleasure from the «Iron Man 2» slot. 5 reels, 25 paylines, a popular theme and a chance to win the progressive jackpot are the things that make any gaming machine worthy of attention, but if the talented developers of Playtech take one of the most popular of Marvel superheroes, the result will exceed all expectations. 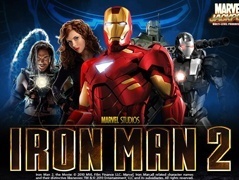 Great graphics of the Iron Man 2 slot is made based on the film version with Robert Downey Jr. in the title role and all other actors are easily recognizable. Some symbols from the lowest category of payments look very similar to each other, but in reality they are completely different symbols, and it is difficult for the the untrained eye to determine immediately whether the line is played and what the payment for it is owed. However, the chance to win is more often and it more easily compensates this drawback! The coins in the slot «Iron Man 2» can varied from $ 0.01 to $ 1 and for each of the 25 lines can be placed up to 10 coins. There is a place to roam and find your own approach, which, however, is to be expected from one of the flagships of the company Playtech. In order to maximize the chances to fight for the progressive jackpot of Marvel superheroes, try to bet the maximum bet in the main game. Three or more "Scattered" symbols on your screen will bring you 10 free spins in the slot machine «Iron Man 2». But be patient, it may take some time before the right amount of gold logos of the Iron Man fall in one scroll. However, when they do fall out, you will understand why they are worth waiting, because the rewards are truly generous. During all the spins the Scatter is in the middle position and the factor increases with each scroll. There is no extra bonus slot games in «Iron Man 2». The slots with Marvel superheroes are remarkable thanks to the opportunity to win one of four progressive jackpots. They can be won at any bet, but the maximum bet significantly increases the probability of being in the game for the jackpot. And here the games begins on a grand scale already. Select one of the 20 cells and find out which of the famous jackpots can be yours. As for me, the last film about the “Iron man” is just awful, what cannot be said about the Slot “Iron Man 2”. Compared with the first “Iron Man” there are few changes, but quite enough to make the game much more interesting, in the external appearance and in content. It’s really interesting, and sometimes profitable.